The drinking industry’s war on ice is in full force. Fearful that ice will water down their precious booze, entrepreneurs are suggesting alternative chilling systems to bring the temperature of their hooch down. But do they work? Ice is effective at chilling a drink because it melts, releasing near-frozen water into your dram. Can alternative technologies do the job, too? There are whiskey stones (soapstone cubes), or the new Tilt Chilling Sphere, a metal spheroid that you fish out of your drink with an included hook, which doubles as a cocktail pick. How effective can these non-melting chilling systems be? We did the science, folks! Here’s the experiment: Take 20ml of 80 proof vodka (imported!) at room temperature (69.3 degrees Fahrenheit). Chill it with a similar volume of frozen material (all fresh from the freezer at 1 degree Fahrenheit) — ice, stone, or metal sphere. 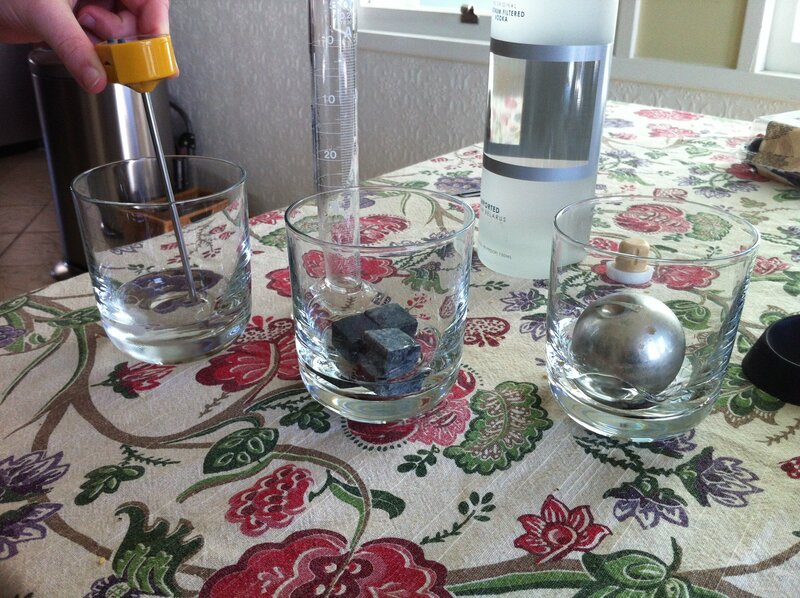 Then measure the impact on the temperature of the vodka at 1 minute, 5 minutes, 10 minutes, and 20 minutes. 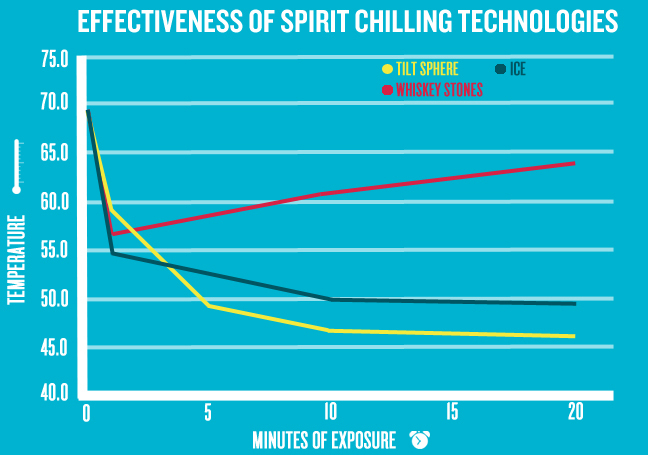 Of course, the ice was initially the most effective at chilling the spirit because it melts, and it melts quickly. But unlike the other cooling systems, it also waters down your drink. Is this a bad thing? Most spirits can handle a little water, but some might suffer. How you deal with this is a personal question. But ice works the fastest, gets drinks very cold, and maintains the low temperature until it’s gone. If you need more, just add more. And there’s nothing to clean up afterwards. How can you argue with that? The whiskey stones have a very specific and troubling issue with them: These have been sitting in my freezer for many months, and when I took them out they smelled — badly — of fish. I didn’t think soapstone could attract smells like this, so be warned if your whiskey stones have been sitting in the freezer since your birthday. (The smell may be primarily due to the bag the stones are held in, but either way, the odor does transfer to the stones.) Surprisingly, they did chill our drink very quickly, though that low temperature was not sustainable and quickly wore off. The Tilt sphere was the least effective chiller at first, clearly because it makes very little surface contact with a small volume of liquid. But it surprisingly caught up with ice — beating it, actually — after 5 minutes in the glass. (That said, you can always use more than one cube of ice, but you won’t fit more than one Tilt in your glass.) It may be even more effective with a larger volume of liquid. The rather large sphere makes drinking with the sphere in the glass uncomfortable (hence the little metal hook you get for removing it). Still, this is a neat trick to chill a drink quickly, and while the Tilt hasn’t been in my freezer nearly as long as the whiskey stones, it doesn’t have any odor — and since it’s stainless steel, it should be less susceptible to smell absorption. Here’s what I don’t get about these whiskey stones. If you want your drink cold, but not watered down why not through the bottle in the fridge? Heck keep a glass in there as well! I frickin’ hate all of these stupid cocktail fads. Ice is used in drinks because the addition of water to a mixture of spirits/liqueurs helps combine their flavors, and making it cold is refreshing. The addition of water to many spirits also opens up fairly delicate flavors. On the whole, colder temperatures usually hide delicate flavors in spirits by numbing the tongue. If someone is trying to drink their straight spirits by making them colder and avoiding diluting them, I question their aims. Thank you so much for doing this simple experiment. I have been looking high and low for something this straightforward regarding the performance of these various materials and it has been surprisingly difficult to find. as the designer of Tilt, I’d like to say thanks for time and efforts to do this experiment and document and share it. As for “stupid cocktail fads”, I am with you. I am a skeptic when it comes to gadgets that often have questionable performance and are merely an exacerbated marketing quip. Hence I design my own products and stand by them. Tilt was designed because round ice molds are usually not that successful, meaning they have seams and crack and then melt just as quick as an ice cube. Also for the people that know that a drop or 2 of water catalyzes your spirit and releases esters and essential oils, I think it is important to note that you only need a drop or 2. And if one has this kind of concern to detail and appreciation of fine spirits, then why not control how many mL of water you dose your spirit with, vs plunking 2 or 3 rocks that have tap water or perhaps some freezer smell tainting them? Further, we chose stainless steel as it is the most durable material that will not absorb flavor and migrate your coffee, to your lemonade, to your wine, to even a soup. Tilt is an everything chiller (eyes, soup, dips, gazpacho, whiskys, beer, wine, whatever). They’re also one step-smarter. The round shape makes them fun to swirl. The weight in the bottom of the ball, means they always roll right-side up. And the included hook and cocktail stick means keeping your fingers out of your drink. And the stand they come with means you can always pull them out of your drink if it gets too cold, as spirits should not be drank below 50F (unless your on spring-break). They’re great gifts, they’re fun to have and allow you to geek out with food or spirits – no matter what the situation they’re extremely universal and pure and cold! Cool product. Nice experiment. It should be obvious, but I think you should throw a control drink in the graph (horizontal line at 69.3 F) to show the difference between these and nothing at all. I would like to see this experiment with Coffee Joulies and similar products (even using these products, but warming them first). Thanks for the science. I have seen some fairly serious papers written about dilution and temperature. Strictly speaking the temp change in ice isn’t from the cold water but rather the energy needed to convert ice from a solid to a liquid. In a shaker this can actually take alcohol to subzero temperatures because the freezing point of ethanol is lower than water. I too think surface area is going to be a big factor and would love to see the tilt vs an ice sphere of comparable size in a full glass. As to the comment about sticking the bottle in the fridge there is an optimal point of consumption. I can’t tell you what it is but it’s somewhere between body temp and just below room temp. Any alcohol served too cold is going to taste like paint thinner because you’re losing out on smell which is the biggest part of the taste experience. Alcohol served cold doesn’t begin to aerosolize right away leaving all those esters on the bottom of the glass rather than in the air. Cool that you actually made an experiment out of it :D I think that was a great idea! I mostly drink port but sometimes I enjoy some whisky. The thing with whisky is, that cooling it only dulls the flavours. It actually suppresses them. Water on the other hand often helps the whisky to open up and unfold its characteristics. ;) And therefore I prefer adding ice (if!) since it has the effect of cooling the whisky, suppressing some flavours and afterwards helping it to unfold. If that makes any sense to you? However, I don’t usually drink my whisky with ice.